This Saturday, September 17th, is Seattle's premier mobile food truck festival, the Mobile Food Rodeo! 25 mobile food trucks from Seattle and Portland will be competing for the 1st Annual Wagon Wheel Awards. The Rodeo will be circling its wagons at Interbay, 1600 West Armory Way between Queen Anne and Magnolia. Seattle Mayor Mike McGinn will be on hand to present the awards. 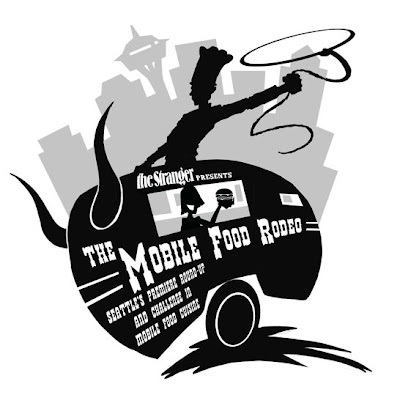 The 1st Annual Mobile Food Rodeo will feature Seattle food trucks Maximus/Minimus, Skillet, Kaosamai Thai, and a lot more! Check out the full list of Seattle and Portland food trucks, and all the event's info at their website, Facebook, or follow them on Twitter. The Mobile Food Rodeo is already planning two more Rodeos next year. One will be in Bellevue in the Spring, and the other in Seattle in late Summer. Round up your family and friends, and mosey on over to the Mobile Food Rodeo!